In addition to an indoor pool, Sandman Hotel & Suites Calgary South provides a spa tub and a fitness center. Dining is available at one of the hotel's 3 restaurants. A bar/lounge is on site where guests can unwind with a drink. Wireless Internet access is complimentary. Business-related amenities at this 3-star property consist of a 24-hour business center and a meeting room. This business-friendly hotel also offers a fireplace in the lobby, room service (during limited hours), and an elevator (lift). Onsite self parking is complimentary. Sandman Hotel & Suites Calgary South is a smoke-free property. 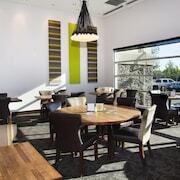 Situated near the airport, this hotel is 2.1 mi (3.4 km) from Carburn Park and 2.8 mi (4.5 km) from Chinook Centre. Firefighters Museum of Calgary and Cash Casino are also within 3 mi (5 km). 3 restaurants, an indoor pool, and a fitness center are available at this smoke-free hotel. Free WiFi in public areas and free self parking are also provided. Additionally, a bar/lounge, a spa tub, and a 24-hour business center are onsite. All 201 rooms offer free WiFi and free wired Internet, LCD TVs with cable channels, and comforts like pillowtop beds and premium bedding. Room service, coffee makers, and hair dryers are among the other amenities available to guests. 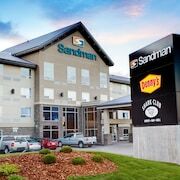 Sandman Hotel & Suites Calgary South offers 201 air-conditioned accommodations with coffee/tea makers and hair dryers. Pillowtop beds feature premium bedding. 32-inch LCD televisions come with cable channels. Bathrooms include shower/tub combinations and complimentary toiletries. Guests can surf the web using the complimentary wired and wireless Internet access. Business-friendly amenities include desks and phones. Housekeeping is provided daily. Full breakfasts are available for a surcharge and are served each morning between 4 AM and 1 PM. 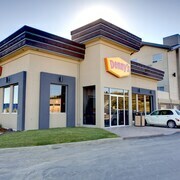 Denny's Restaurant - This restaurant specializes in American cuisine and serves breakfast, brunch, lunch, and dinner. A children's menu is available. Open 24 hours. Open daily. Shark Club Sports Bar - This sports bar specializes in American cuisine and serves lunch and dinner. Guests can enjoy drinks at the bar. Happy hour is offered. Open daily. 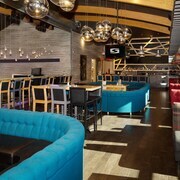 Moxies Grill and Bar - This restaurant specializes in American cuisine and serves brunch, lunch, and dinner. Guests can enjoy drinks at the bar. A children's menu is available. Happy hour is offered. Open daily.